Bathymetric surveys are increasingly becoming an integral part of the hydraulic studies that has to be performed on a regular basis. Detailed bathymetry data is useful in estimating zones of sediment aggradation and degradation in rivers (with implications to Bridge Structure Sustainability). Reclamation needs to collect depth and velocity data in rivers for numerous habitat and sedimentation investigations. Numerical models of river hydraulics, sediment transport, and vegetation growth and mortality are used to predict river conditions over a range of flows. These models depend on accurate channel bathymetry and flow velocity data. Using modern acoustic depth-sounding instruments and GPS equipment mounted to a floating raft, a small team of hydraulic engineers can map the bathymetry of 50 or more river kilometers in a matter of days. 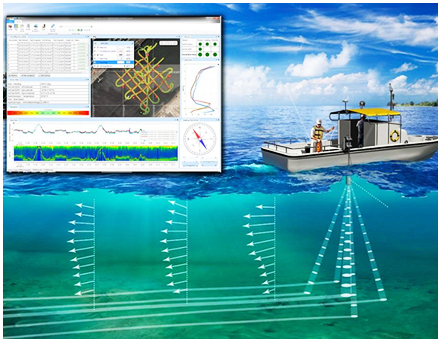 The newest generation of acoustic Doppler current profilers has up to five acoustic beams acquiring spatially distributed samples of water depth, thus greatly increasing the resolution and quality of the data without any increased man-hours in the field. After the field data-acquisition process is complete, post-processing and integration of data is necessary in order to glean physically-relevant information. The process of relating ADCP data to data from the GPS receiver is unnecessarily time-consuming. 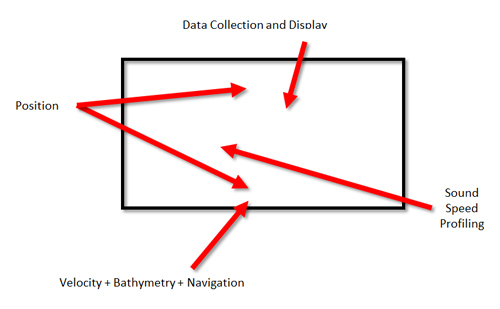 This process is commonly performed using GIS tools, and requires approximately a day of processing time per day of field data-acquisition for typical bathymetric studies. But with the modern technology, simple sediment surveys can be completed in a fraction of the time required using these older methods and with a higher degree of accuracy. The HydroSurveyor is a system designed to collect bathymetric, water column velocity profile, and River Bed 3D Mapping data as part of a hydrographic survey. The two key components of the system are the HydroSurveyor Acoustic Doppler Profiler (ADP®) platform, and the powerful, yet user-friendly, data collection software. With the HydroSurveyor platform is able to offer an exclusive 5-beam depth sounding device, with built-in navigation, full water column velocity (currents) profiling, full compensation for speed of sound , and integrated positioning solution. The HydroSurveyor is a highly sophisticated system which includes 5-beam depth sounding, water velocity profiling and navigation capabilities. When mounted in the ARC boat, the HydroSurveyor scans the reservoir as it is guided across the water’s surface. Recorded data is then analyzed by HydroSurveyor software to produce accurate depth measurement in addition to bathymetry maps of the entire water body. With a small amount of post-processing in GIS or 3-D CAD, an accurate water volume can be determined. The HydroSurveyor system employs a 9-beam ADP, using 5 beams at any one moment for depth measurements from a wide footprint on the water bed. This means that the time spent “driving” the boat is minimized in comparison with single beam instruments. Importantly, the HydroSurveyor is able to operate in depths ranging from 0.2m to over 40m. The HydroSurveyor also incorporates built-in navigation, full water column velocity (currents) profiling, full compensation for speed of sound and integrated positioning. The HydroSurveyor is unique because it is the only product that is able to make real time corrections for thermoclines, saline stratification and the effects of boat pitch and roll.” User-friendly software provides a central recording and processing platform that enables users to develop bathymetric maps, using properly gridded data points - a function that is automated and fully embedded in the software. Another one of the great advantages of the HydroSurveyor is its seamless integration with the CastAway-CTD for sound speed compensation of depth and current data. When used together, the data are interpolated in space and time to ensure high quality surveys. Copyright © 2018. Oberoi Thermit Pvt.Ltd All Rights Reserved.